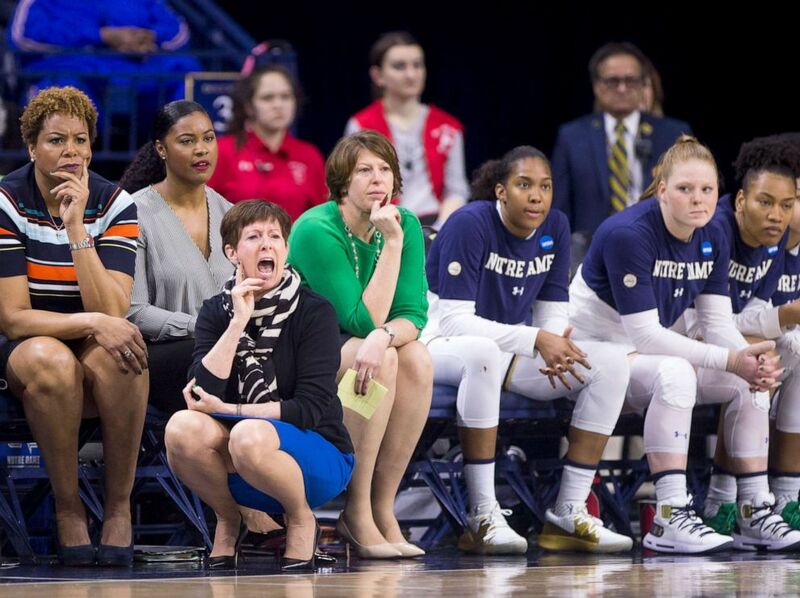 Muffet McGraw thinks it's time for a change in sports and beyond. camera (Robert Franklin/AP) Notre Dame head coach Muffet McGraw yells at her players during a second-round game against Michigan State in the NCAA women's college basketball tournament in South Bend, Ind., March 25, 2019. 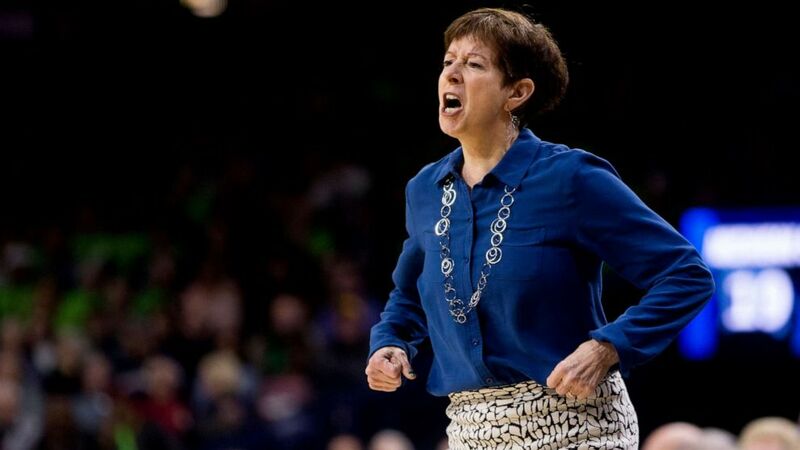 More girls than ever are playing sports and Notre Dame basketball coach Muffet McGraw thinks it's time they start seeing more women in athletic leadership roles. "We don't have enough female role models," McGraw said Thursday at a Women's Final Four press conference. "We don't have enough visible women leaders. We don't have enough women in power." McGraw pointed out that many young female athletes are taught "great things about life skills," but it would be great "if we could teach them to watch how women lead." "When you look at men's basketball, 99% of the jobs go to men," she said. "Why shouldn't 100 or 99% of the jobs in women's basketball go to women? Maybe it's because we only have 10% women athletic directors in Division I. People hire people who look like them. And that's the problem." I'm getting tired of the novelty of the first female governor of this state, the first female African-American mayor of this city. A report from The Institute for Diversity and Ethics in Sports released earlier this year confirms McGraw's stat about athletic directors and details that nearly 24% of all Division I head coaches were women. Within women's basketball, the numbers are a little better. Nearly 60% of coaches are women while 40% are male, but in men's basketball, there are no female head coaches. McGraw, who has had male assistant coaches in the past, said she's decided in recent years to have an all-female staff, as reported by ThinkProgress, noting the lack of a level playing field for women to get jobs in men's basketball. Her comments echo those of the late Pat Summitt, long seen as the leading voice among female coaches and women's athletics. McGraw has also raised her voice to promote leadership of women in other professions. "I'm getting tired of the novelty of the first female governor of this state, the first female African-American mayor of this city," she said Thursday. "When is it going to become the norm instead of the exception? How are these young women looking up and seeing someone that looks like them, preparing them for the future?" (Robert Franklin/AP) Notre Dame head coach Muffet McGraw yells to players during a first-round game against Bethune-Cookman in the NCAA women's college basketball tournament in South Bend, Ind., March 23, 2019. She added, "I think women across the country in the last few years have just said, 'Enough,' … Time's up. Time's up. It is our turn. If it's going to happen, we have to do something about it. You see women marching in record numbers across the country. Women are coming out and being more active politically." Additionally, she said, "We have the Equal Pay Act. Women are making 77 cents on the dollar. That's just white women. Women of color are lagging way further behind. I'm not talking about white women being coaches. We need more diversity in our game as well." The semifinal games of the women's NCAA Division I Women's Basketball Championship take place Friday night, with No. 1-ranked Notre Dame taking on No. 2-ranked University of Connecticut Huskies, while University of Oregon plays Baylor. The winners of each game will play against each other Sunday night.